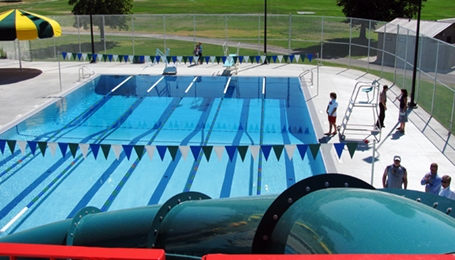 In early 2007, the City of Spokane, Washington, retained the team of Counsilman-Hunsaker and ALSC Architects to prepare construction documents for new and replacement aquatic centers at six municipal regional parks. After numerous public meetings with the northwest community and various neighborhood groups, city staff determined that the Shadle Park site (between the municipal library and the adjacent high school) would be ideal for the new Shadle Pool. In order to serve the community’s best interest, the northwest community was excited and involved in assisting with the aquatic amenities and colors for their facility. The final outcome was tremendous, resulting in an opening day supported by the entire community with capacity crowds throughout the summer.